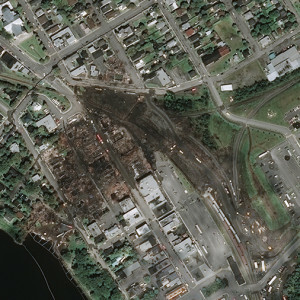 Following the train disaster in Lac-Mégantic on July 6, 2013, the International Charter on Space and Major Disasters was activated by Public Safety Canada. As part of its mandate for the Rapid Information Products and Services (RIPS) of the Canadian Space Agency, Effigis has produced a satellite image map of the effects of the disaster, based on an image acquired from the QuickBird-2 Earth Observation Satellite on July 7, 2013. Following this, Effigis has been mandated by the Quebec Department of Public Security (MSP) to provide weekly satellite images of the disaster zone. The images are taken from Astrium’s Pleiades constellation (1A and 1B) and are processed and optimized by Effigis to facilitate monitoring the operations on the site. Effigis will continue to provide imaging to the MSP until the end of August.